One of the best ways to learn about the diverse people in this world is to study religion and theology. 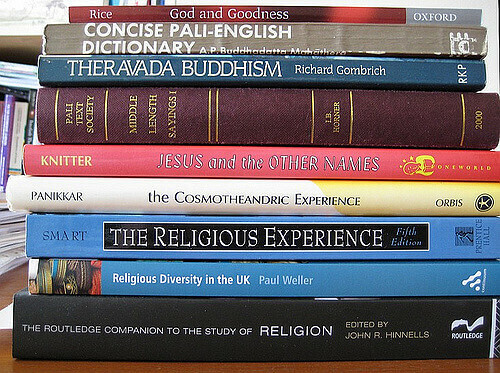 Whatever your own beliefs, religious studies provides you with a greater understanding of all the different viewpoints people share. “You can expect a space where students are encouraged to think about a wide variety of topics in religion (history, literature, anthropology, theology, sociology, philosophy, and a wide range of critical perspectives to name a few) from a number of different perspectives,” University of Chicago senior Lauren Eames said. You question the basic fundamentals of human existence and begin to understand the role religion plays in social conflicts and change. “For some it may be uncomfortable, especially if you are a religious person. I am not religious, but I read and learned and really challenged myself with that major. Religion impacts your life everyday. Watch any show [or] listen to any politician, there is a religious undertone or themes or morals involved,” 2015 University of Iowa graduate Lindsay Graf-Juarez said. Every school has different requirements, but despite different course codes, some classes are universal. “There is one required class which is an intro to methodology style class (Intro to Religious Studies), and then ‘distribution’ requirements across Historical Studies, Constructive Studies. and Cultural studies,” Eames said about UChicago’s program. Completing basic world history classes are essential too. Everyone knows King Henry VIII married a bunch of women, but he broke from his religion to do so. How did that affect British history? That’s the stuff you need to know. Once you ace introductory courses, classes range from leaders in civil rights history to the oppression of Native Americans to the sacred and secular nature of Judaism. Religious studies majors aren’t bound to the walls of churches, mosques or temples. Opportunities extend beyond just the religious aspect of the major. The Rabat Internship program, based in Morocco, allows students to explore the language, culture, religion and politics of the Middle East and North Africa. If you’re politically fired up, opportunities even lie within the United States Commission on International Religious Freedom, an organization dedicated to defending the right to freedom of religion all over the world. If staying in the U.S. is more your speed, you can intern with local religious organizations, non-profits, universities or businesses. Your knowledge of other cultures makes you the perfect candidate to intern with Friends Against Hunger, a nonprofit organization focused on feeding the hungry around the world. Hospitals such as the Methodist hospital in Memphis, Tennessee, offer chaplaincy internships that tailor to students’ spiritual, social or intellectual interests. Religion in public schools is a hot button topic, but a religious studies major is a great foundation for becoming a teacher, especially if you double major. If you choose to work in a private school, religion might be part of the curriculum anyway, so basic knowledge of other cultures puts you at a major advantage. While religion may not be the core of a family’s problem, you can put your analytical skills and empathetic nature to work as a social worker to bring people together. A community development role sometimes requires you to travel all over the world, and if you understand what is important to those countries (like their religion), your job gets much easier. Religion plays such a large and influential role in current events. Religious studies classes really improve your writing and analytical skills, so you’ll graduate ready to take the New York Times by storm. A civil service administrator travels extensively and interacts with people from other countries. A religious studies background provides the stepping stone to working with those countries efficiently when discussing policies. Megan Deppe is a junior Journalism and Cinema double major at the University of Iowa. She loves movies, which she constantly reminds people on her blog ReelTalk, and she can hold an entire conversation using nothing but Friends quotes. But she’s not a nerd- okay, that may be a lie.